Discover the charm and grace of Old Key West in a new and distinctive setting. 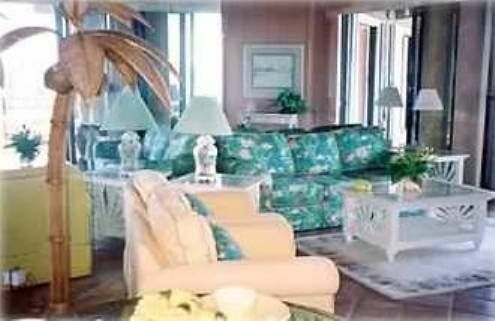 Luxury, two-bedroom, two-bath, waterfront condominium set in a topical garden paradise with sweeping balconies overlooking the Atlantic Ocean. Your vacation hideaway is decorated in authentic island tradition with fully-equipped modern kitchen, living room with wet bar, and dining room. Washer/dryer, phone, TVs, stereo, and over-sized jacuzzi tub in the master suite. Your bit of paradise features a lush tropical garden complete with an Olympic-size, oceanfront, heated pool, and sun deck with adjacent bubbling whirlpool. Balmy Caribbean breezes caress you from your sweeping balcony. For your sporting pleasure, there are three lighted tennis courts (one which is clay), racquetball courts, and pro shop. Your condominium has a unique barbecue/picnic area, and features 400 feet of private frontage adjacent to Smathers Beach. Also available is a private slip that can accommodate 30' boat. Our Condo complex is directly on the beach. No need to cross street. Apartment had all we needed and nice view! Very nice property with beautiful pool and ocean view. We really enjoyed it! From the moment we arrived we were impressed! Security let us in and gave us the complete rundown of the property. The condo is absolutely beautiful! Enjoyed our morning coffee sitting on the balcony looking at the ocean water. The most well stocked place we have ever rented. After booking the owner was very quick to respond with any questions we had. Loved the location. Right next to smathers beach and away from all the hustle and bustle of Duval Street. Easy to get around the island! If we ever return to KeyWest we will definitely check availability here first. Highly recommend this property! Beautiful condo, we will return! This was a great condo! Very comfortable, beautiful views, had all the amenties needed and then some. The kitchen was fully stocked with kitchen items. The owners were super helpful and easy to contact with any questions. The pool and quad forestry was gorgeous! And of course the ocean view from the balcony was amazing! We will definitely return! One of the best places on the island to stay. Property exceeded our expectations. The pictures were nice but the condo was much nicer than the pictures. The pool and grounds were kept very nice and the condo was very clean and offered everything you would need for your stay. The view from the balcony was wonderful to watch the ocean. I would definitely recommended the rental and when coming to Key West would rent this location again. The owner was very responsive when needed and it was greatly appreciated. 1800 Atlantic is located directly on the beach, facing the Atlantic ocean. It picks up the cool night breezes and absolutely beautiful scenery. When you walk out of the complex, you are 5 steps from the beach and an Olympic size swimming pool, kept immaculately clean. It's superb location enables you to hear the quiet ocean ripples and the palm trees shifting in the air. You will not find a better location and condo facility in Key West Florida, period.